An Evening of Bliss! Day 1 ;) | Diaries of Swapnil. Dharavi School kids were invited to take the stage over then! Rishi K then invited Vikram Hazra to just take over the stage! Vivek Oberoi came on to the stage and went! followed by a couple of bhajans and then a small video of Vasundhara – tackling Global warming problem! Everybody’s eyes just turned up there! He walked over on to the ramp magnificently! We need to awaken VIVEK (wisdom that discriminates), then life will be enjoyable. Someone just jumped over the ramp and just lied down in front of HIM! HE walked on the ramp! HE went over to the other side! We shouted Guruji!!!!!! HE came HE walked and left us mesmerised! Right in front! HE showered the petals! But eyes could not move away from HIM! 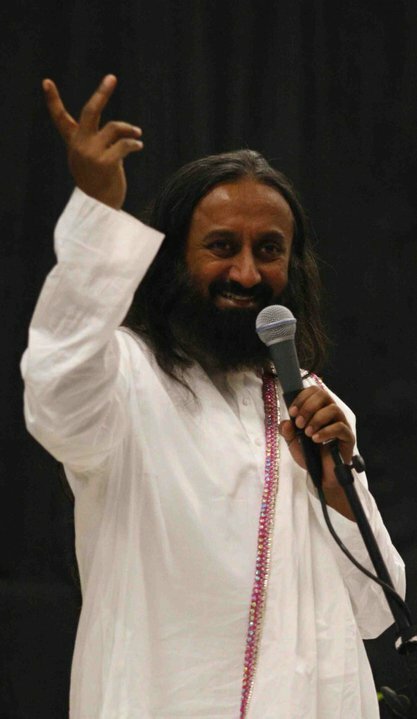 Audience were waving to Guruji and cheering. Guruji was talking and then for a moment! Usually a speaker speaks and speaks leaving no time for the person to grasp! Jahan saans tham jaata hai waha chetana jaag jaati ha. There is slum India and there is Scam India but there is now need for a spiritual India! Make a sankalp for a spiritual india! and when u take only responsibility and have no needs, u get the power to bless and fulfill others needs. Guruji lead us all into a meditation! G: Frequency of OM is same as that of earths rotation about its axis. OM means love, purity, infinity, eternity, truth. Wth its vibration the prana becomes complete. Awesome meditation, was like a soothing gentle touch. Super cool Swapnil..Please keep posting like this..i want to know every bit of Guruji’s visit.